I bought my first pomegranate of the season at my local supermarket yesterday. Quince season is upon us, good apples are back and it’s time to pull out the soup pot and make soup again. I absolutely love Autumn. It is a time of year when you actually feel like doing some real cooking again, braising, stewing, baking and making soups like this old fashioned hippy split pea soup from The Moosewood Cookbook. I also have my first cold of the year, which isn’t so great but at least it’s cool enough to eat soup while I’m coughing and feeling sorry for myself. This recipe makes a huge pot of soup which simmers slowly for hours and fills your house with a wholesome homey-ness that says ‘this is a house where we know how to look after ourselves – we eat apples and we make soup’. 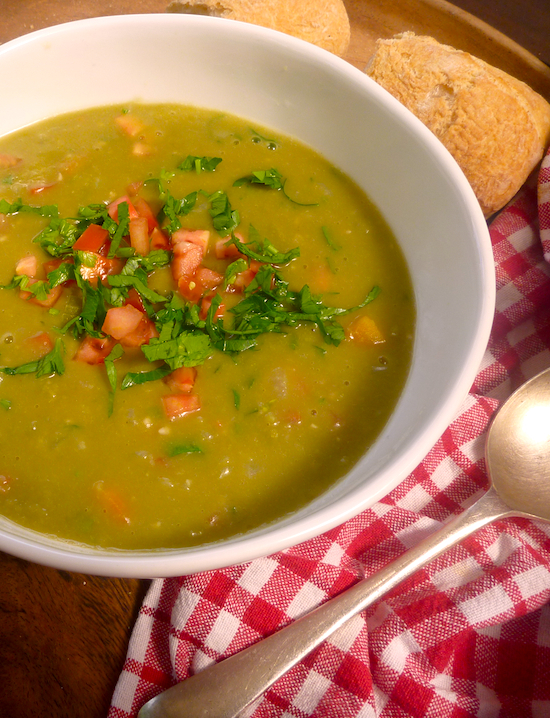 My mother used to make split pea soup with a ham hock and, while I don’t use a ham hock, this soup still connects me to childhood memories which is always a good thing when you’re making soup. What more can you say really – it’s soup and it’s good. Note: The original recipe calls for fresh tomatoes which I use when there are any decent ones available but, otherwise, I use canned tomatoes and add them to the soup earlier. It also uses dry mustard powder and I like any recipe that uses dry mustard powder because it gives me a good excuse to buy Keen’s mustard powder in their gorgeous retro tins. Place split peas, bay leaf and salt in large pot with seven cups of water. Bring to a boil and simmer slowly covered for 3–4 hours. Heat olive oil. Saute minced onion, garlic, celery, carrot and potato until tender (add a little water if necessary). Add to soup with tomatoes (if using canned). About fifteen minutes before serving time add wine, mustard, thyme and sesame oil. Just before serving add vinegar, parsley and tomato. If there was a prize for international soup of the year (there probably is one, but haven’t had a chance to look), this would win hands down. It’s flavoursome and nourishing and anything that uses Keen’s mustard powder is sure to be a big hit. 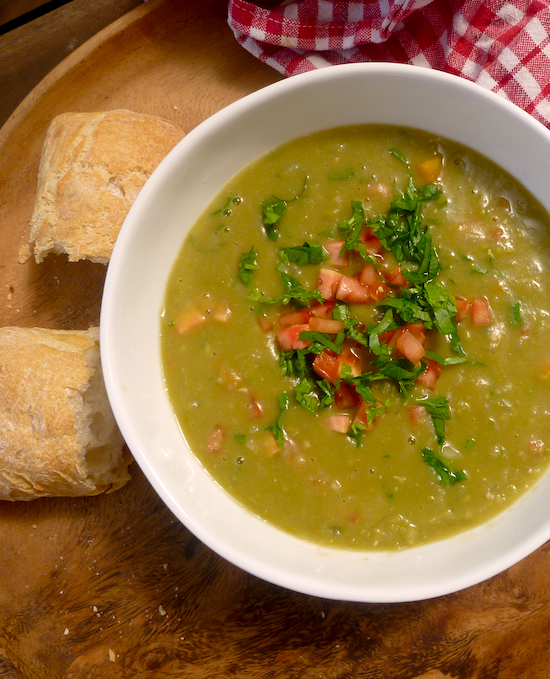 On another cool and rainy day in the NE, this soup would be the perfect comfort food. And thanks for reminding me to re-visit my Moosewood cookbook (Enchanted Brocoli Forest, too). Moosewood was the first vegetarian cookbook I ever purchased and it still stands up, despite the passage of what? 30 years??? Yes it’s getting on the Moosewood. Anna Thomas’s The Vegetarian Epicure is probably worth a re-visit too but I don’t have a copy of that in my collection. Greetings. I am making this soup this evening. How much Vinegar should be used? I always have Keens mustard powder too. Add it to simple potato salad and watch the eyebrows will raise up in delight. Thank you for the recipe. I will use my very large pressure cooker for this as I never have enough time ! My pressure cooker needs a new valve and I haven’t got it replaced for years, you’ve just reminded I really should do so.